This tattoo inspired ring echoes the maxim that there is a fine line between love and hate. In the case of this Love Hate Ring, that line is your finger, and you can show what you prefer by giving this ring a gentle twist. This bold band lacks the traditional ring face, favoring a more subtle and clean-cut design that utilizes a solid, decorated band that sits easily on your finger. 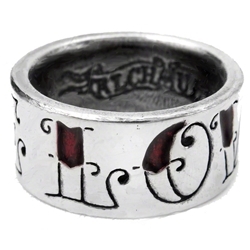 One side of the ring features tattoo-styled script that reads Hate, complete with black enameling in the letters, while the other side reads Love, with red enameling in the letters. The interior of the ring is also engraved with a scroll design that reads ALCH UL13. The ring is made from fine English pewter and is offered in three different sizes. Love, hate - it is all fiery passion, and the two make for a striking design that is represented right here on this Love Hate Ring.